If you ask me, the keenest fishermen catch the better fish. When you’re rugged up in a nice warm bed in the middle of winter back home, you think to yourself, you must be crazy to be going out fishing but when you hook onto that big one, you know it is all worth it. A friend of mine, Steve Miller, found out it was worth getting out of his warm bed, early one cold August morning, recently. Fishing in Moreton Bay with a mate of his, the wind started blowing up to 15 knots with a few white caps appearing. They were wondering whether to pack up and head for shore or to stay that bit longer. It was overcast and cold but then, just as the dawn was breaking, they found themselves amongst a school of hungry snapper. Everybody talks about “the one that got away” .The first one Steve hooked up on was a stonker. Unfortunately he dropped it just before he could get it back to the dinghy. Next drop and he was back on again. He couldn’t believe his luck! After fighting this big guy for about 10 minutes (he said it felt like hours) he landed him. 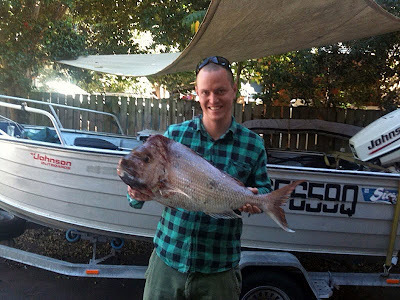 Steve caught him on a 2-4kg rod with 15lb braid and 10lb fluorocarbon leader with a 4” Jerk Shad. 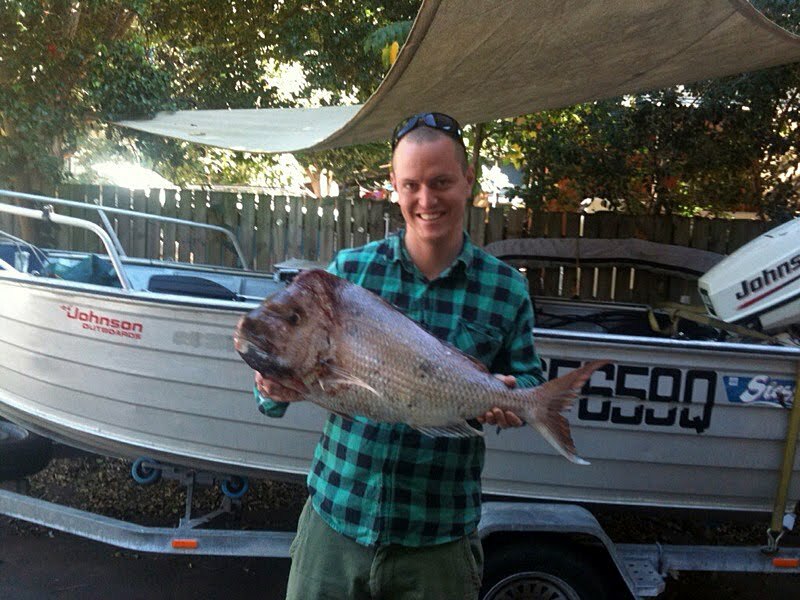 It weighed in at 6.5 kg and was 82cm in length. Moral of the story - The early bird catches the worm. See you out there early one morning.